About 10 times today, I have clicked on the review icon with the red dot. There's always a suggested edit review pending. When I click on it, each time it told me that the review queue has already been cleared. Can't that button update itself when the queue is cleared? It's so annoying that I am fored to write this Meta post for it. The sneaky thing here is that it wasn't cleared - the text lies. You simply already reviewed all the items you could (and weren't eligible for some, like a bunch of tag wiki suggestions I just cleared out). These ones you couldn't review for one reason or another were still active review tasks that we need help with... but you can't help with them. It's definitely irritating that it asks. An old, but still reasonably accurate, meta post: What does the number next to the review link in the top bar actually mean? on /review you see the number of tasks available for you personally. 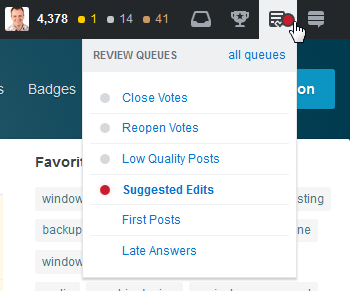 Approve edits to old questions where the edit only incorporates comments?